Sand Under My Feet: Sheinside Summer Clearance Sale! The end of summer is just around the corner for those who are living in the northern hemisphere and most of you want to get your wardrobe ready for fall. But you shouldn't empty your bank, and SheInside comes to the picture by helping you shop versatile pieces that will be worth your money. Do you have them in wishlists too? Hurry and check out their huge sale section and snag those gorgeous pieces for all your wardrobe essentials before they get sold out. 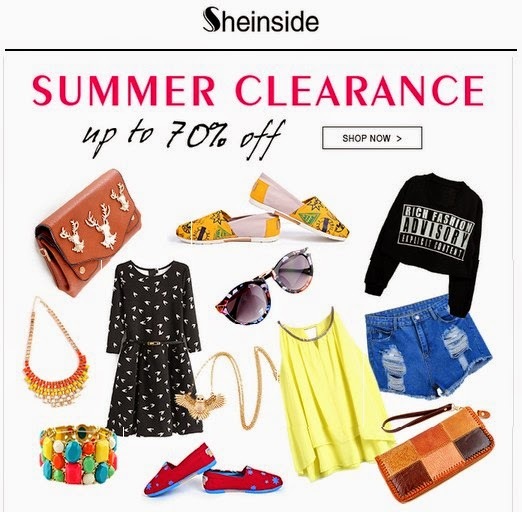 Click the links and the banner below to see what's in store at SheInside.com's Clearance Sale! You know how no one can argue with us girls, that we can't have too many clothing pieces so enjoy shopping girls! Sheinside definitely offers really great variety of clothing! I will check out their sale!